Nola receives medical attention at the San Diego Zoo Safari Park. 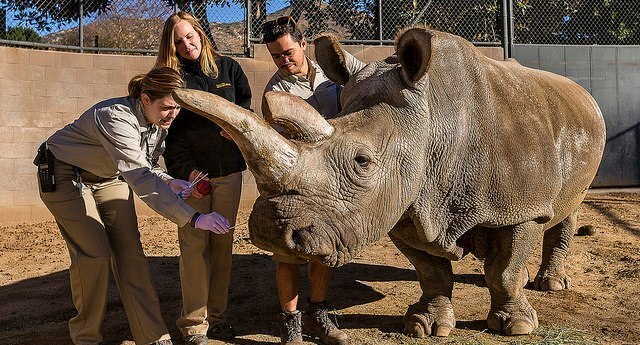 A nasal swab sample is taken from the northern white rhinoceros. ©San Diego Zoo Global. All rights reserved. Welcome! This is a guide to finding veterinary and biomedical information, online and at the San Diego Zoo Global Library. Use the tabs above to explore specific topics: general information, anesthesia/restraint, apps, bites/stings/envenomation, diagnosis, diseases, literature/databases, nutrition, organizations, pharmacology, toxic plants, zoos.